The uppersides, never seen at rest, are essentialley orange with broad brown borders, but the male forewing is heavily dusted with brown scales and often appears completetly brown. In both sexes the basal half of the hindwin is dusted with brown. 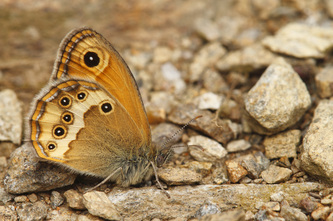 The forewing has a large apical eye-spot, with or without a pupil, and the hindwing has an arc of blind eye-spots curvin inwards towards the centre of the wing. 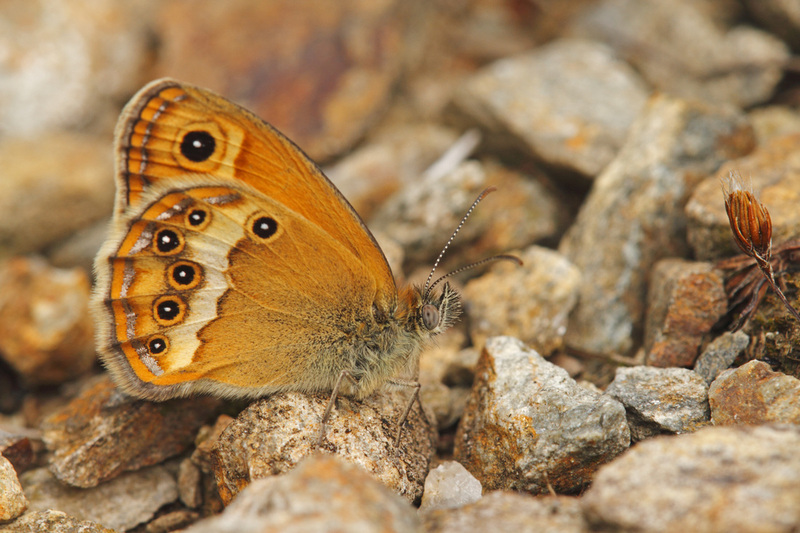 The underside of the forewing is orange with a pale post-discal stripe and a large apical eye-spot, and there is a silvery line. 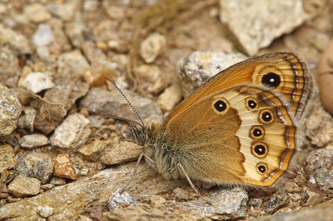 The underside of the hindwing is yellowish brown at the base with a white stripe. Beyond this, the wing is yellowish with an inwardly curving arc of pupillate eye-spots and a silvery line. The anterious eye-spot, on the front edge of the wing, lies to the inside of the white stripe. Flight from June to August in rough, stony and warm hillsides and grasslands. The larval foodplants are fescues and other fine-leaved grasses.